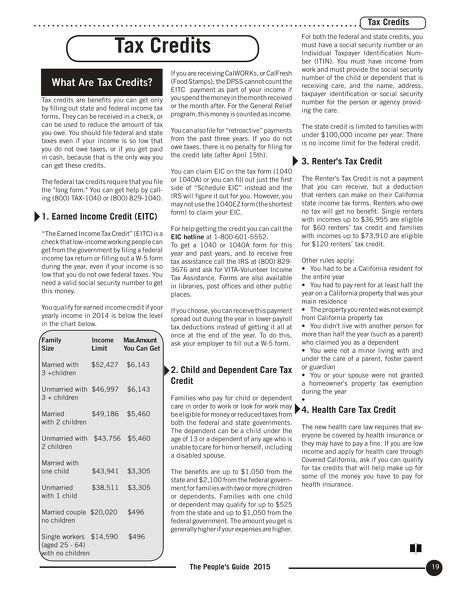 19 The People's Guide 2015 Tax Credits Tax Credits What Are Tax Credits? Tax credits are benefits you can get only by filling out state and federal income tax forms. They can be received in a check, or can be used to reduce the amount of tax you owe. You should file federal and state taxes even if your income is so low that you do not owe taxes, or if you get paid in cash, because that is the only way you can get these credits. The federal tax credits require that you file the "long form." You can get help by call- ing (800) TAX-1040 or (800) 829-1040. 1. Earned Income Credit (EITC) "The Earned Income Tax Credit" (EITC) is a check that low-income working people can get from the government by filing a federal income tax return or filling out a W-5 form during the year, even if your income is so low that you do not owe federal taxes. You need a valid social security number to get this money. You qualify for earned income credit if your yearly income in 2014 is below the level in the chart below. Family Income Max. Amount Size Limit You Can Get Married with $52,427 $6,143 3 +children Unmarried with $46,997 $6,143 3 + children Married $49,186 $5,460 with 2 children Unmarried with $43,756 $5,460 2 children Married with one child $43,941 $3,305 Unmarried $38,511 $3,305 with 1 child Married couple $20,020 $496 no children Single workers $14,590 $496 (aged 25 - 64) with no children If you are receiving CalWORKs, or CalFresh (Food Stamps), the DPSS cannot count the EITC payment as part of your income if you spend the money in the month received or the month after. For the General Relief program, this money is counted as income. You can also file for "retroactive" payments from the past three years. If you do not owe taxes, there is no penalty for filing for the credit late (after April 15th). You can claim EIC on the tax form (1040 or 1040A) or you can fill out just the first side of "Schedule EIC" instead and the IRS will figure it out for you. However, you may not use the 1040EZ form (the shortest form) to claim your EIC. For help getting the credit you can call the EIC hotline at 1-800-601-5552. To get a 1040 or 1040A form for this year and past years, and to receive free tax assistance call the IRS at (800) 829- 3676 and ask for VITA-Volunteer Income Tax Assistance. Forms are also available in libraries, post offices and other public places. If you choose, you can receive this payment spread out during the year in lower payroll tax deductions instead of getting it all at once at the end of the year. 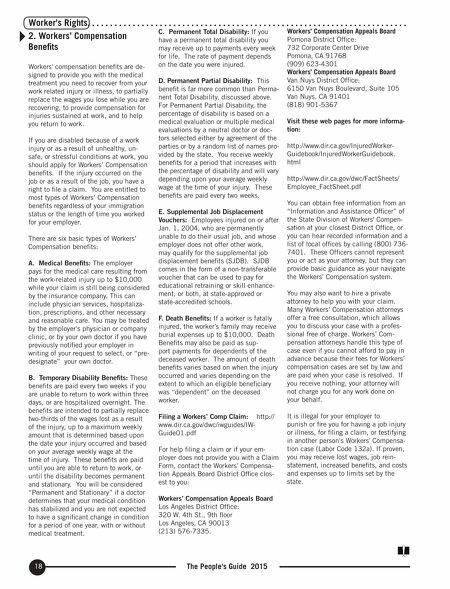 To do this, ask your employer to fill out a W-5 form. 2. Child and Dependent Care Tax Credit Families who pay for child or dependent care in order to work or look for work may be eligible for money or reduced taxes from both the federal and state governments. The dependent can be a child under the age of 13 or a dependent of any age who is unable to care for him or herself, including a disabled spouse. The benefits are up to $1,050 from the state and $2,100 from the federal govern- ment for families with two or more children or dependents. Families with one child or dependent may qualify for up to $525 from the state and up to $1,050 from the federal government. The amount you get is generally higher if your expenses are higher. For both the federal and state credits, you must have a social security number or an Individual Taxpayer Identification Num- ber (ITIN). You must have income from work and must provide the social security number of the child or dependent that is receiving care, and the name, address, taxpayer identification or social security number for the person or agency provid- ing the care. The state credit is limited to families with under $100,000 income per year. There is no income limit for the federal credit. 3. Renter's Tax Credit The Renter's Tax Credit is not a payment that you can receive, but a deduction that renters can make on their California state income tax forms. Renters who owe no tax will get no benefit. Single renters with incomes up to $36,955 are eligible for $60 renters' tax credit and families with incomes up to $73,910 are eligible for $120 renters' tax credit. Other rules apply: • You had to be a California resident for the entire year • You had to pay rent for at least half the year on a California property that was your main residence • The property you rented was not exempt from California property tax • You didn't live with another person for more than half the year (such as a parent) who claimed you as a dependent • You were not a minor living with and under the care of a parent, foster parent or guardian • You or your spouse were not granted a homeowner's property tax exemption during the year • 4. Health Care Tax Credit The new health care law requires that ev- eryone be covered by health insurance or they may have to pay a fine. If you are low income and apply for health care through Covered California, ask if you can qualify for tax credits that will help make up for some of the money you have to pay for health insurance.